Iperf is a very versatile open source program that can be used for network performance testing. It can generate TCP or UDP data streams for measuring network throughput and can also be used for testing network latency and jitter. 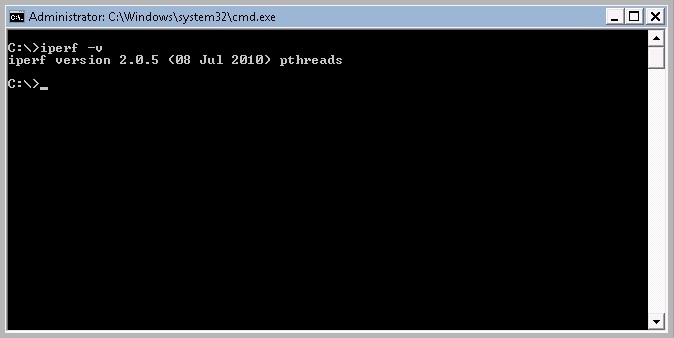 There are some older versions of iperf compiled for Windows available on the web but I couldn’t find a working link for iperf version 2.0.5 so I decided to try compiling it using Cygwin and it worked! You can download iperf version 2.0.5 for Windows that I compiled from source or continue reading if you want to learn how to compile your own copy. You’ll need to copy iperf.exe and also the 3 cygwin DLL files included in the zip archive into your system in order for it to work. Cygwin is basically a Linux emulation environment for Windows. Although your Linux apps will have to be recompiled from source before they will run in the Cygwin environment. To get started you will need to download and run setup.exe from the Cygwin site. 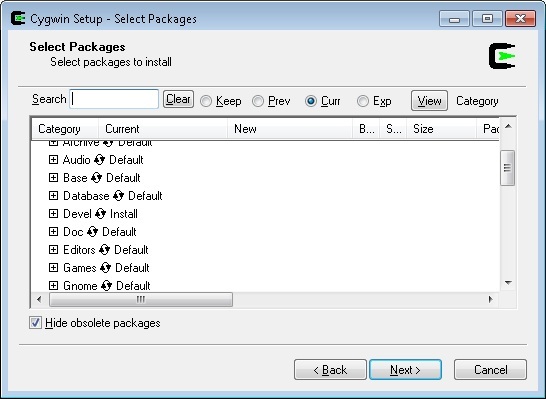 You can use the default install options but when you reach the package selection screen click on ‘Devel’ so that ‘Default’ changes to ‘Install’ , this will install all of the development tools you will need. You should have a shortcut to Cygwin on your desktop when the installation is finished. 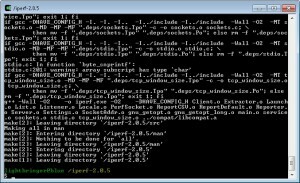 Next download and extract the iperf source code to C:\cygwin\iperf-2.0.5 , 7-zip works well for extracting tar and gzip files in Windows. Start the Cygwin shell from the start menu or the shortcut on your desktop. If everything went well your output should look something like this. To get the compile process started just type make and hit enter. It shouldn’t take very long for the compile to finish. You can run iperf directly from the Cygwin environment but you will have to specify the full path to the executable eg: /usr/local/bin/iperf. If you prefer to run iperf directly from a Windows command prompt or from another machine you can copy the iperf binary and the nessasary DLL files out of the cygwin environment. You will also need the following DLL files found in C:\cygwin\bin. Copy the three DLL files and iperf.exe somewhere on your system that is in your path like c:\windows\system32 for example. You can then run iperf directly from a command prompt. I’m working on a separate post with some sample uses for iperf which should be completed in the near future. I haven’t tried it yet, but thanks for this tutorial! No problem! I hope you find iperf on windows to be useful. Thanks for the work. I’ve been trying to find an updated version for Windows for awhile. I have a question though. The documentation page references a option -S, which allows you to set the type-of-service on the outgoing packets. It does not appear that this version supports that flag. Could you confirm please? Thanks again! I don’t believe any of the newer releases of iperf allow you to set the type of service field. You might consider looking into a program called mgen which is supported on Windows and Linux. It’s an open source utility which allows you to generate traffic with the TOS bits set. Iperf 3 has this issue on Windows as well. It’s somewhat annoying to deal with but I haven’t been able to produce a solution to the problem. Thank you for putting this up. Working from Sourceforge and other places that Google searches show, it seems unnecessarily obtuse for a plain old Windows user to run an iperf test. Do I really need to figure out how to compile an executable??? Sheesh. With your files I got it going in a matter of minutes. Simple. THANK YOU. so i have problem for compile please help me bro…….. I didn’t have any luck trying to compile iperf-3.0b4 in cygwin either. It turns out someone has already accomplished it though, you can download the precompiled version from the link below. It runs fine on my Win7 X64 box. Just make sure you extract iperf3.exe along with all of the cygwin dll files to the same directory. i was wrong because i didn’t add make pkg in my cygwin so i trouble, after read your blog very carefully i have add make pkg than it’s work well i have got iperf3.exe. 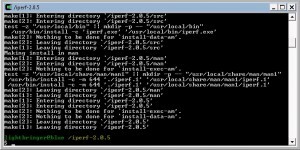 In order to run without the cygwin dll files you need a version of iperf compiled for native win32. Below is a link to version 2.0.4 which has been patched and compiled to run without any cygwin dll files. Do have any procedure to uninstalled this iperf via unix cmd? I’d like to share some expirience with some modern builds, mb it will help someone. I’v faced with some problems building iperf modern versions with current head commit. Ok, I decided to build some stable version so choosed 03eb163 commit this is 3.0.2 stable. because there were some func name “redifinition” in iperf_api.h iprintf function – name collisiosn with cygwin stdio.h definition. produced NO output files. So build process was stuck. Gitignore cleaned to make it easy to clean all builded already object files and other generated. And voila, while make process there was system libtool script used and everything went ok. I understand that its ugly hack, but in my case it worth it and i have no time to deeply investigate cygwin generation nuances caosing libtool to be broken. Configure scripts are usually included inside the source tarball of a package. Can you provide a link to the package you are trying to compile? libtool: compile: gcc -DHAVE_CONFIG_H -I. -g -O2 -MT iperf_api.lo -MD -MP -MF . I am developing one Android APP where i need to integrate iperf for Android. 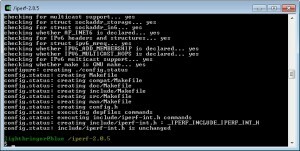 Could you help me to compile iperf for android in cygwin? What are the procedures? Hi folks. Thanks for the tuto by the way. configure: error: The dpkg development files (dpkg-dev) must be installed to build this package.